It's been a tough few years with lots of Rocky Roads. 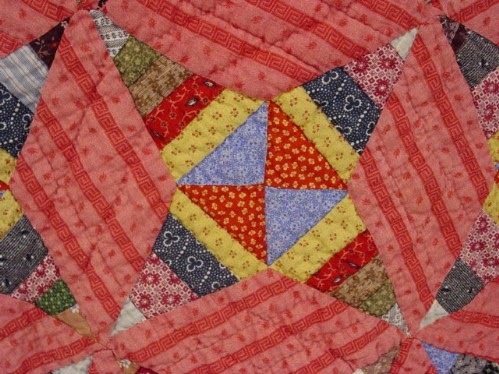 Here are a few of the quilty variety. I love the double pink greek background. Only in Southeastern PA would bright pink be a neutral. So blessed to have a quilt made by my great grandmother. Love that it is my favorite color: purple. She made hers in a large scale and used all sorts of different sized pieces for the star strings. Interesting to see the pair together and observe the differences and the similarities. They are part of my antique quilt study "Patterns Through Time" Lecture where I share sets of antique quilts and guide you through changes in quilt-making and American history. Lots of eye candy and interesting information along with a lot of design inspiration. I'm available to teach at your quilt guild, shop or show. "HAVE QUILTS, WILL TRAVEL"